Also known as Prickly Spear Grass and Coastal Speargrass, Austrostipa stipoides (syn.Stipa stipoides) is a tussock forming grass found widely in coastal areas. 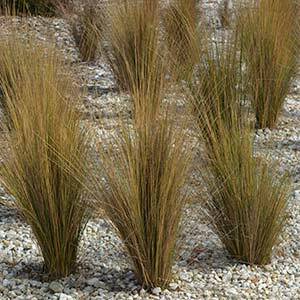 Forming neat tussocks Austrostipa stipoides does come in a number of forms and will vary a little in height. This is a very low care ornamental grass that requires little pruning. Excellent is sandy soils and well drained poor soils. Occasional applications of slow release native plant fertiliser will be beneficial. Best landscaping applications are in open areas where it is exposed to winds and periods of dryness. Excellent in coastal gardens as well as in coastal land reclamation. This is a spiky of prickly plant as the name suggests and is best planted away from traffic areas and pathways. tThis evergreen tufting grass has a nice architectural look to it when planted in groups. Common Names – Prickly Spear Grass, Coastal Speargrass. Spread – Will form a dense tussock to .5m and greater. Foliage – Brown to Bronze green. Flowering period – Spring too summer. Frost tolerant – Yes, Medium to High. Coastal conditions – Well suited. Propagation Easy by division, also possible from seed however smoke treatment may be needed.